The forklift safety signs help you set up a safety area whilst using forklifts in a warehouse, loading zone, outdoor working site, and more! 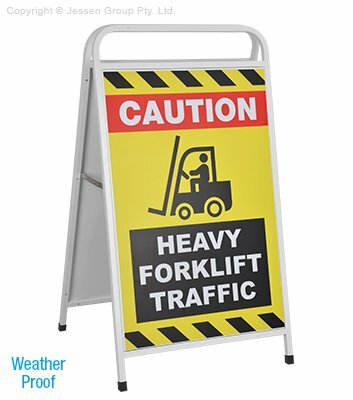 The caution forklift sign includes a printed signs that says " Heavy Forklift Traffic" in white lettering against a black background, with an image of a forklift as well. For added awareness, the top of the sign has "Caution" printed in white against a red background to really stick out. The top and bottom of the printed signage have black and yellow stripes that are standard in work zones as a message to be heeded. The outdoor A frame board, forklift safety signs use a folding pavement sign to make it easy to display this message wherever it is needed. The lightweight sign is made from white powder coated steel, ensuring durability with an easy to spot look. The weatherproof frame can be left out in rain and light winds without worry of the stand deteriorating. Each leg has a plastic foot cap with a tread, helping to keep the display stand in place whilst preventing the steel from damaging floors. For maximum exposure, this display is dual-sided, able to be seen in multiple directions at once to alert passersby of forklift use. The display is easily portable as well, folding small to be transported or stored in between uses. The top of the pavement sign has an easy to grip bar for carrying the display into position. Set-up takes seconds as hinges inside between the twos sides of the display lock down into place to keep the stand upright. Orders from Slimline Warehouse despatch fast to anywhere in Australia, purchase today!